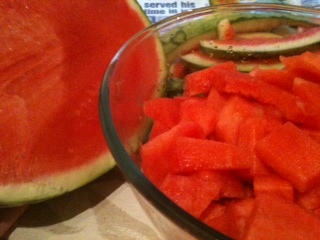 Fabulous food find today was a HUGE – SEEDLESS watermelon from Costo in Aberdeen at £2.99. Absolutely fabulous and the kids are hugely impressed with how much there is in the bowl after I sliced it all up to put it in the fridge for nibbles. 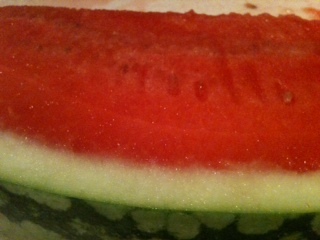 Watermelon works out at about 30 calories per 100g (according to my iphone diet calorie checker). 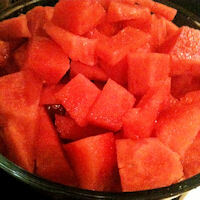 A whole kg worth of water melon would only set me back 300 calories. Now that is a stomach filling prospect. Wow – I was there too – maybe we walked write past each other! Have just blogged about my Costco purchase! Leave me a twitter link if you have one. Perhaps we did pass by. It’s lovely isn’t it. I have to say that the watermelon is done already.